Having said that, there are a lot of gems that I found while reading through my old poetry archives. My hope is that this act of re-reading and sharing some of my past work will also inspire me to exercise my creative writing poetry muscles more as I progress in my 30s. One of the more optimistic poems from my early days, “Do” has a Dr. Seuss feel to it. The lines are short and the words are simple. Seriously though, after reading some of my emo-tastic stuff from this era dealing with relationship heartache, this was a great change of pace and suggests that maybe I wasn’t as depressed as some of my less polished writing would have let on. This poem was written during one of those aforementioned sad times; however, rather than venting about it in another unsavory poetic diatribe, I found consolation in the form of my dog Rocket. Strange as it seems to admit it, this was a turning point in my relationship with my pet. As the poem says, he becomes more than a dog—he becomes a friend who listens and loves unconditionally during a time when I needed exactly that. The poem itself has some clunkiness, but that seems fitting of my 19-year-old self. I penned this poem about my favorite time of the year more than a decade ago, and it still rings true for me today. As I approached my 21st birthday, I was not filled with excitement as much as apprehension, which comes across clearly in this poem. I am one of the few people I know who did not partake in the traditional ritual of getting drunk on my 21st birthday. I was not ready for it at that point in my life, and that’s one example of when I was proud that my stubbornness won out. Eventually I altered my stance, but I did it on my terms when I felt comfortable and responsible enough to handle the consequences. If I’m not mistaken, I wrote this for my Academic Discourse class during my freshman year of college. It is a personal proclamation with a not-too-hidden message if you read the last line of each stanza. I have always enjoyed playing with the form of poems in that way, and this is one of my earlier examples. My critical eye, given the benefit of 11 years, recognizes that the poetic language could be tightened in this poem to make the lines flow more smoothly. Nonetheless, this poem does capture my feelings about my favorite sport, basketball. I liked it so much when I first wrote it that I actually had it printed on a T-shirt and had a relative buy it for me as a Christmas gift. This poem was written days after Derek Fisher hit a miraculous shot to help my beloved Los Angeles Lakers win at the buzzer. I already detailed my adoration of Fisher, #9 on my favorite athletes list. But this poem was my attempt to put that one unforgettable moment into words. It seems fitting that this poem, which I wrote about a photograph of Michael Jordan’s final shot as a Chicago Bull, is #23 on the list. Number 23 is synonymous with Michael Jordan, and perhaps this one shot symbolized his greatness more than any other. 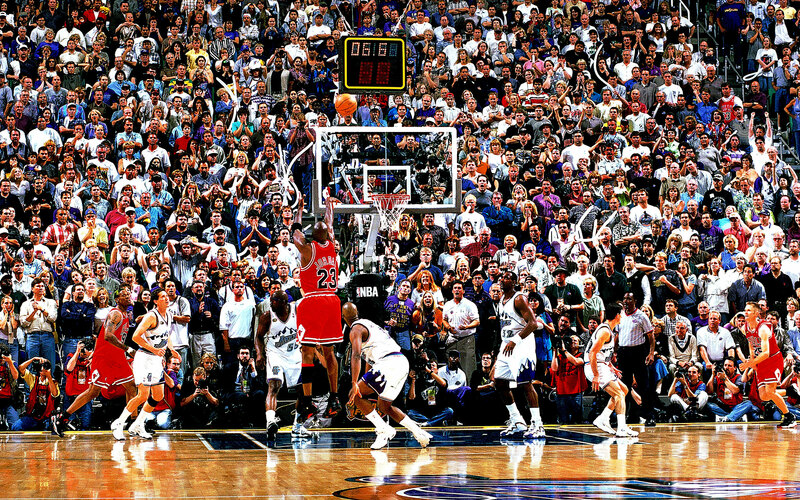 This shot was the one he made to win the 1998 NBA Finals over the Utah Jazz, and it is an iconic sports image. Thus, “Perfect Shot” takes on a double meaning—both Jordan’s jumper and the cameraman’s photograph capturing this moment forever. One of the few poems that I have written recently, “When I Asked Them to Write” took me less than 15 minutes to compose. I wrote it immediately after giving my students an assignment to write a poem of their own. This is the first of several persona poems to make the list from my aforementioned Senior English Project at Mercyhurst. This one is written from the perspective of the basketball coaches who cut me from the varsity team during my senior year of high school. I wish I had a good explanation as to why the lines in the stanzas are, in order, eight lines, seven lines, six lines, five lines, three lines, two lines, and one line (seemingly leaving out a four-line stanza). But if I had a reason then, I do not remember it now. Have you ever heard a song that felt like it was written about your life? Well, that’s how I felt during this time period about seemingly every Counting Crows song. I wrote this poem about a year after my first live Counting Crows concert experience in an attempt to put words to how connected I felt to the band, especially the lyrics of lead singer Adam Duritz. This is another persona poem from my Senior English Project. This one was written from the perspective of the person who became my best friend in college. The ending hinted at my concern that we would not remain in each other’s lives after college. Thankfully that worry proved to be wrong. This is yet another persona poem from my Senior English Project. I did not have a lot of close friends in high school, but this one friend made up for that. He and I spent a lot of time together, especially senior year. Although we went to different colleges, we remained close and each served as a groomsman in the other’s wedding. I wrote this poem from his perspective about always being a friend I could count on. In addition to the 15 persona poems, my Senior English Project also featured five self-portrait poems. These poems, which were written from my perspective, saw me experiment with language and the way the words of the poem were arranged on the page. This is the only one of the self-portrait poems that made my top 30; the others are perhaps even more abstract and experimental than this one. I like this one because I wrote it using only word magnets. I sometimes find that putting some type of limitation on my writing—a word count, a specific form or pattern—forces me to get creative in ways that complete freedom to write everything about anything does not. I wrote this poem after watching a hip hop countdown show on TV in October of 2004. This is probably as close as I’ve come to writing a rap of my own. I’m pretty pleased with this output from the 20-year-old self. The complex diction, rhythm and rhyme make me think of someone like Talib Kweli or Mos Def, both of whom I was likely listening to for the first time around then. This poem recounts the aftermath of a Dave Matthews Band concert that I attended with friends. The poem includes some personal details that I am opting to keep private and unpublished; however, I am too proud of it as a piece of writing not to include it on this list. In the spring of 2011, I did my student teaching during the day, worked as a graduate assistant at Mercyhurst in the evening, and spent my nights finalizing lesson plans for the next day. I was also preparing to be married that summer. The only time I was able to go to the gym was at the crack of dawn, so three days a week, I set my alarm extra early and went to the gym early enough to workout, shower, eat breakfast, and still make it to Westlake Middle School by 7:30 a.m. I was always surprised by how many people were at the gym so early, especially the number of old men. They had a tendency to linger in the locker room chatting with one another like they were at a social club. One day, their off-color conversations inspired me to write this poem. From 2002 until 2006 I worked at Giant Eagle as a bagger and shopping cart wrangler. The job helped me buy my first (and second) car, and I met a lot of interesting people there (including my wife!) I did not always enjoy working there though. OK, I complained a lot, but that’s what young people do, right? My most consistent complaints came when I had to work a carts shift, meaning that I would spend anywhere from 4-8 hours outside retrieving customers’ shopping carts and returning them to the store. Often times during my carts shifts, I would spend my down time in the maintenance closet, writing notes to my favorite cashier or penning poetry on paper towels. On one particularly miserable, rainy day, my carts shift inspired this poem. This is actually the poem that was memorably dubbed a “perfect poem” during its in-class workshop in Creative Writing Poetry class. Having said that, I did make a few minor revisions to the poem before submitting it in my portfolio at the end of the term. I actually began writing this poem while I was working outside at Giant Eagle. Wandering a parking lot filled with cars in weather that seemed not quite summer and not quiet autumn, I came up with the idea to write a poem comparing driving to the changing of seasons. As I developed the idea further, the “driving” took on symbolic implications and the poem grew from there. My Grandpa Nies passed away Oct. 14, 2006, at the age of 76. He was the first grandparent that I lost. While I know that I was more fortunate than many, getting to know all four grandparents for more than 20 years—nearly all the way through my college years—but that did not make it any easier when he died. At Grandpa Nies’ funeral, I was the one asked to deliver the eulogy, and I think I honored him well. Nonetheless, this persona poem, another entry from my Senior English Project, was one final tribute written in the voice of Grandpa Nies. A few weeks before the annual Polish Falcons Bowling Banquet, I wrote this poem about two very different bowling experiences. I’m proud to say that I am no longer quite as green as the novice bowler in the poem. However, I also have a lot of work to do before I can picture myself as the expert bowler in the poem either. When I turned in my portfolio of edited poems at the end of the term in my Creative Writing Poetry class I wrote in regards to this poem, “Without a doubt this was the most challenging poem to write this term. The ‘Formal Poem’ forced me to write within the strict confines of a pre-determined poetic form. I chose to embrace the challenge and attempt writing the first villanelle of my life.” The poem is, on the surface, about the complex nature of writing a good poem by incorporating various poetic elements, although there is more to it than that if you read closely. Neither of my parents are poets. My mom, a nurse and clinical analyst, has a more scientific, rational, straightforward way of thinking about things. My dad is certainly creative, but he creates pottery instead of poetry. With all of that in mind, it was fun to write a poem from their perspective as one of my persona poems for my Senior English Project. It’s no surprise that of all the persona poems I wrote for my Senior English Project, “Jessie” was the longest by a significant margin. I had a lot to say about what I thought she would say to me. This poem was written when I was a senior and she was a sophomore in college. By this time, I had already written many poems about my thoughts toward her, so it was a fun, creative exercise to turn the tables on myself. The moment I found out that I was going to be a father, I knew I wanted to commemorate it somehow, but I was at a loss for words. The process had been more challenging and taken longer than I had expected, and upon finally hearing the good news—when I thought I’d be bursting at the seams to express my joy—I instead met with an untimely bout of writer’s block. I managed to jot down a few ideas, but it wasn’t until several months later that I finally found my creative spark and completed this poem. I’m really proud of the way it turned out. Not only was I able to capture my feelings both during the process and after finding out the good news, but I did so in a compact, organized poetic structure. Count the syllables in each line and you’ll find that each of the three stanzas consists of seven lines with syllable counts of 10, 8, 6, 4, 6, 8, 10. Earlier in this countdown I mentioned that putting some constraints on what I can write sometimes opens creative avenues I would have otherwise ignored. “Brash Me” is a perfect example. In order to write this poem I took my full name and the full name of my then-girlfriend (now wife) and found that our names shared seven letters in common. Those seven letters, B, R, A, S, H, M, and E spell out the title of the poem. The entire poem was then created out of words that included only those letters in some combination. Those limitations forced me to concentrate on conveying my message in a very direct, simplistic manner. The end result was a poem that stood out among my other work as something entirely different, but it was very well received when I presented it in my Creative Writing Poetry class, and it has remained one of my personal favorites as well. If you have already read the list of my favorite Matt’s Mixes, you know that 4.15.05 was a special date for me and Jessie. The numbers 4.15.05 represent the date of an unofficial date that we shared together on the campus of Mercyhurst. In addition to being commemorated in sound with the music on the aforementioned Matt’s Mix CD, I also did my best to put that night into words in the form of this poem. The poem is full of musical references itself. Additionally, the stanzas are 4 lines, 15 lines, and 5 lines long in reference to the date that will live on forever in Matt and Jessie relationship history. Of all the persona poems that I wrote for my Senior English Project, none packed a punch quite like this one, which I wrote from the perspective of my dog Rocket. Most of my poems on this list have a more serious tone. Rocket probably the funniest poem I have ever written, and it is my favorite poem to perform.